The Fundamental Review of the Trading Book (FRTB) rules require banks to decompose risks into (and hold capital against) risk factors, or exogenous characteristics that cause changes in position values. The standards provide a definition of what makes a risk factor “modellable” for capital purposes, with non-modellable risk factors (NMRFs) requiring extra capital to be held. Last year’s ISDA quantitative impact study found that this add-on could account for some 30% of total market risk capital. With bank trading operations already struggling to maintain profitability under high capital requirements from Basel III, tough business decisions will need to be made unless they can find ways to reduce the capital impact of FRTB to maintain profitability. Current efforts are focused on exploring reductions in NMRF-related capital. Increasing available data can also increase the modellabilty of risk factors and reduces capital. IHS Markit previously published research that demonstrated how external transaction data can be combined with a bank’s existing, internal data sets to increase the modellability of risk factors. This in turn led to capital reductions of as much as 40% through the reduction of NMRFs. However, even using external data, the impact of NMRFs remains significant, leading banks to look for other ways of reducing the number of non-modellable risk factors. Under the first approach, the proxies are created using rules to find the closest modellable tenor from the interest rate curve. The “closest fit” modellable risk factor is then used to proxy the NMRF. Under the second approach, a statistical model looks to ascertain the best proxy by looking for the most correlated risk factors and using data from that modellable risk factor as a proxy for the NMRF. The research uses IHS Markit internal data and a hypothetical swaps portfolio, as in the previous study. 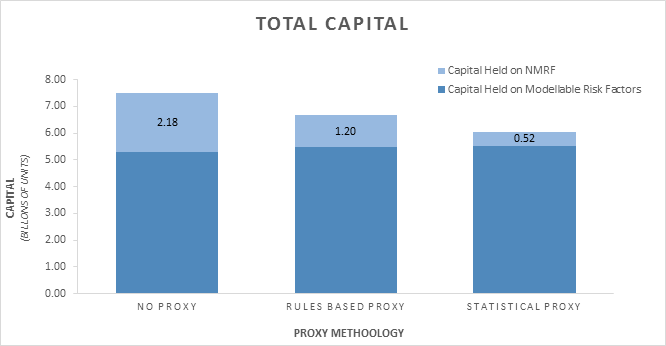 While both approaches have merit in their transparency and auditability, our research to date shows that the second method delivers the best overall proxy, as well as the greatest capital savings. In the example above, using the rules-based approach reduces capital by 11%. However, the statistical modelling approach produced a 19% saving in capital. As these results will likely vary when applied to different asset classes, work will need to be done to understand the differences in these two methods by instrument type. We are already expanding the research into different asset classes to ensure the results hold true and to explore further the effects of the assumptions made in the two methodologies. However, what is clear is that using proxies and the selection of the proxy methodology can have a significant impact on NMRF capital charges. Given the earlier ISDA findings, this is clearly an area of research worth pursuing. If you would like to discuss this article, please contact Neil McClurg. Find information about the IHS Markit solution for FRTB, here.